Jane Lewis’s Il Serraglio depicts a boat gently floating on the waters of one of the many canals in Venice. 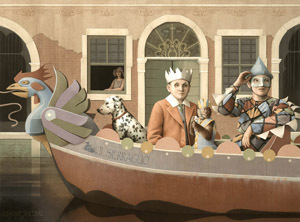 It seems that the boat is a part of a grand procession, with itself decorated as a dragon-like rooster-headed gondola. The vessel carries two men, a monkey with a small mask in hand and a Dalmatian. A girl with a nice hat watches with a somewhat languid curiosity from her window-seat of an ancient building in the backdrop. The faces of both the men on the gondola are covered with masks. No one is sure what emotion they are trying to hide behind their pretences. Jane Lewis’s portrayal of her own time is thick with plots and sub-plots. And as viewers try to peel one layer to dig deeper into the story another layer appears beneath posing a further set of riddles to be solved. As always with any great work of art the audience too becomes a part of the enigma and engages in a mental game with its creator. LC: How did the immediate environment at home help in moulding the artist and human being in you? JL: I can’t say that it did. Perhaps my being an only child, and also the experience of serious illness in early childhood, conditioned me to the solitude and inward view necessary for the kind of work I do. My family had no interest in the visual arts. While not understanding me they nevertheless did not discourage me. I was drawing and painting all the time, and my parents gave me paper, sometimes rolls of wallpaper, pencils and paints. To their advantage, it kept me quiet and amused from a very early age. My first glimpse of real painting was in a children’s magazine called Look & Learn where a famous painting was reproduced each month. LC: The 60s and 70s in England saw a creative surge that pervaded the world of music and visual art. How did this youth oriented cultural movement influence you? JL: I was naturally obsessed with pop culture then. We now have a kitsch nostalgia for the music album art of the late 60s, but at the time album artwork of the calibre of Klaus Voormann’s Revolver and Peter Blake’s Sergeant Pepper for the Beatles were exciting and ground–breaking. I felt completely immersed in the music and style of the time. When I was about 16 I saw a major exhibition of Pop Art, when it was actually contemporary, in London. Before that I was making pilgrimages to the Tate Gallery where Surrealist painting, though by then not modern, had a profound impact on me. 60s style and art was pervaded with the surreal and the infinitely possible. Bowie in the 70s projected an artificial theatrical look laced with ambiguous sexuality that I liked. He knew the mime artist Lindsay Kemp, who also influenced me - I saw many of Kemp’s performances in London in the late 70s and also met him. LC: How much of a help and/or hindrance was the formal education in your artistic evolution? From or beyond the world of art who left an indelible mark on your mind? JL: I couldn’t wait to finish school and leave home and so managed to get into art school very young at 17. The first year provided a good grounding in drawing and design, though painting was not encouraged. Then disillusion struck when I began my undergraduate course in Fine Art where figurative work was generally disparaged and the teaching of even the most rudimentary technique in painting was entirely absent. I retreated into printmaking where at least some technical skill was required and where the tutors were not too concerned about visual content. Because of this I went on to study Fine Art printmaking at the Slade School of Art, where to my relief imaginative figurative work was encouraged and through this I found my way back into painting. My tutor there was Portuguese artist Bartolomeu dos Santos, and I later worked as his assistant at the Slade. He taught me respect for materials and technique, and encouraged a rigorous approach to composition. The college being almost next door to the British Museum, we made many visits to their prints and drawings collection where I was introduced to the marvelous imagery of Durer, Goya and Breughel. I also had a liking for the English visionary artists such as Blake, Fuseli, Spencer and Burra. My taste was then not at all Italianate – that came later. LC: How have your frequent trips to Italy and close encounters with its rich cultural and artistic heritage nourished your soul? You have received inspiration from early renaissance masters but did not let yourself imitate their work, instead created your own niche. How do you endow your brushes with your own identity as an artist? JL: I visited Italy twice when I was very young, just package tour family holidays, but on each occasion I saw Venice and was entranced, especially by the exoticism of the Basilica di San Marco. Then decades passed until I once more went for a longer period and fell in love with Italy, which for me is a living art gallery. There is an aesthetic tradition and respect for the visual arts there that is lacking in my own country. Classicism had already entered my work because I had paid a great deal of attention to paintings in London by Piero della Francesca, Catena, Bronzino, Botticelli, Uccello etc. But in Italy seeing early Renaissance, Roman and Etruscan painting in situ, on the very walls it was designed for, was an entirely different experience. It seemed to be in its proper place with its own voice intact with which one could communicate. Its influence has been by a kind of osmosis. I didn’t return home thinking, now I shall try to paint like that. Rather it seeped into my own aesthetic, crept in around the edges. classical/modernist style that I admire - Severini, Funi, Donghi and Campigli. My current passion is for the work of Edward Burne-Jones, who also felt a deep affinity with Italy. But my tastes in art are not exclusively Italianate, nor of the past. I can be a magpie and take ideas from things seen or half-remembered, my own imaginings, from mythology, music and particularly evocative reading. I like fantasy and the surreal. LC: Do you maintain a sketchbook to register your observations? How much of your work is laced with fits of spontaneity? JL: I work in a measured methodical way, so fits of spontaneity are rare! Having said that, when I am at the midway point of a painting I invariably find that the painting has a will of its own and my despair at its intractability causes me to take chances and make alterations. I keep sporadic sketchbooks mostly of compositional ideas, and I make lists of subjects for future pictures with their working titles. Many drawings are on scraps of paper that I don’t keep, while others will be developed into something more finished and exhibitable. I also like to draw on tracing paper so I can turn it over to judge the composition’s balance in reverse. LC: Oil, watercolour or pastel, all media have their own eventful history and artists use and reuse them on canvas and paper blending them with their own imagination. How important does the contribution of medium become in this form of visual storytelling? JL: My principal working media now are oil paint, pastel and conte crayon. All three have a sensuality that suits my working methods and my subject matter. There is a discipline to pastel painting, limits to its physical application. For example, only a certain surface build–up is possible before the pastel crumbles to the floor, and fixing alters its appearance so must be done sparingly and judiciously, if at all. Conte is difficult to erase so requires a sure hand and focused imagination. I like to work within those restrictions. It has its effect on how an image is realized. Oil painting on the other hand is boundlessly versatile, as well as having an intrinsic beauty and eventual grace in its ageing. Perhaps fatal qualities for me because of the temptation to rework endlessly and build slowly with layer upon layer of paint. I feel that it links my own visual story-telling by a thread woven through centuries of oil painting. LC: “All art is autobiographical; the pearl is the oyster’s autobiography” - how much of this is true for Jane Lewis? JL: My work is all about myself and my responses to the world and my inner world. This is why I dislike commissioned portraits, which I have had to do sometimes to earn money - when I choose my own models or have a relationship with the subject it is a different matter. My pictures contain a narrative. I can’t tell you where it began or how it will end. My fantasies, obsessions, fears and dreams are in there. I feel that painting should create another world rather than simply reflect what we ordinarily see. LC: Masks feature prominently in many of your paintings. Does it amaze you that as an artist you are peering through the soul, thereby unmasking your subjects? Why is this fondness of incorporating dynamism in characters that shift them to a state where they are not mere portraits but buzzing with life? JL: I can only try to interpret. We each live within our own interpretation and approximation of the world and each other. No-one truly knows me or anyone else and so there may as well be a mask - the mask being a choice of how one presents oneself, the mask itself being a kind of unmasking. It can be an invitation to look closer than convention allows. It can be a way of displaying oneself as something other, something flamboyant or inscrutable. Sometimes a face I am painting becomes unconvincing, and so I add a mask to lift it out of the bland or commonplace. Since I was a student I have felt seduced by theatricality – in Bowie and Lindsay Kemp, a year I spent in residence with an opera company, my love of Venice and Commedia dell’Arte, friends who are dancers and performers. Thus the mask. LC: What do you say to yourself when after a hard day’s work your painting fails to satisfy your critical eye? Is there any one piece that is closer to your heart than others? JL: On a bad day I say to myself, why after all these years have I not learnt how to paint? Each picture presents a new puzzle to be solved, throws up numerous problems. I have not managed to be the kind of artist who has a formula to be repeated with small variations, unfortunately because then I may have had commercial success. Therefore every new work makes me feel I am drowning until I finally salvage something that satisfies me. My most recent work is always the closest to my heart. I could list those I regard as important pieces, but when they are finished and have left my studio I feel distanced from them. LC: If you are requested to summarise your artistic evolution over the years what would that reveal? That as a very young artist I was cowed by current fashions in art then gradually and haltingly found my own voice, one that has been alternately strong and faltering over decades. I have spent an artistic lifetime working outside of art trends and drawing on an inner strength and belief drawn from my own created and imagined world, something like an outward expression of the inner fantasy world of a child but tempered by experience. At this mature point of my life I would summarise that I have so far produced a strong and idiosyncratic body of work that has been my reason for being.